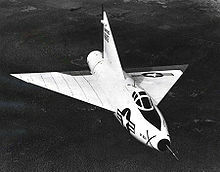 The Convair XF-92 was the first American delta-wing aircraft. Originally conceived as a point-defense interceptor, the design was later made purely experimental. However its design, suitably enlarged, led Convair to use the delta-wing on a number of designs, including the F-102 Delta Dagger, F-106 Delta Dart, B-58 Hustler, Navy's F2Y Sea Dart as well as the experimental XFY. The XF-92-nicknamed Dart-traces its ancestry to an August 1945 USAAF proposal for a supersonic interceptor capable of 700 mph speeds and reaching an altitude of 50,000 feet in four minutes. Several companies responded, and in May 1946 Convair (then still Consolidated Vultee) won with their proposal for a ramjet-powered aircraft with a 45-degree swept wing under USAAF Air Materiel Command Secret Project MX-813. However, wind tunnel testing demonstrated a number of problems with this design. Looking for solutions, Convair came across the work of Dr. Alexander Lippisch, who had come to the United States as part of Operation Paperclip. Before and during the war, Lippisch had worked on a variety of delta-wing aircraft, first as low-speed gliders, and later as high-speed interceptors. Lippisch had concluded that the delta-wing was a natural design for supersonic flight, as the highly swept leading edge remained free of the shock wave off the front of the aircraft. He had plans to develop this as the Lippisch P.13a, but progressed only to a unpowered glider example, the Lippisch DM-1. The P.13 design consisted of two large triangles joined together. One formed the main structure and wing, the other was the vertical stabilizer and cockpit. The only deviation from the triangular layout was an oval air intake at the nose, and round nozzle at the rear. The engine was powered by coal dust stored in a large rotating disk, the odd power source being a solution to the twin problems of lack of petroleum and manufacturing capability in Germany at the time the design was being proposed. Convair took up Lippisch's work, redesigning it for jet power using the 1,560 lbf Westinghouse J30 assisted by a battery of six 2,000 lbf liquid-fueled rockets. The engine layout was rather portly and would not fit cleanly into the wing of the original P.13 layout, forcing a redesign. The new layout placed the engine in a seemingly oversized cylindrical fuselage, moving the pilot out of the triangular rudder into a separate cockpit centered in the middle of the fuselage, serving double duty as a shock cone for the engine intake. The basic layout of the fuselage was very similar to the Miles M.52 design, although the M.52 did not use a delta wing. The rudder, no longer serving as the cockpit as well, was reduced in size. The new design was presented to the U.S. Air Force in 1946, and was accepted for development as the XP-92. In order to gain in-flight experience with the delta wing layout, Convair suggested building a smaller prototype, the Model 7002, which the USAAF accepted in November 1946. The design was similar in general layout as the original, but by placing the pilot in a conventional cockpit at the front, instead of centered in the fuselage, the resulting aircraft looked considerably less odd. In order to save development time and money, many components were taken from other aircraft; the main gear was taken from an FJ-1 Fury, the nosewheel from a P-63 Kingcobra, the engine and hydraulics were taken from a Lockheed P-80 Shooting Star, the ejector seat and cockpit canopy were taken from the cancelled Convair XP-81, and the rudder pedals were taken from a BT-13 trainer. Construction was well underway at Vultee Field in Downey, California when North American Aviation took over the Vultee plants in summer 1947. The airframe was moved to Convair's plant in San Diego, and completed in the autumn. In December it was shipped without an engine to NACA's Ames Aeronautical Laboratory for wind tunnel testing. After testing was completed, the airframe was returned to San Diego, where it was fitted with a 4,250 lbf. Allison J33-A-21 engine. In April 1948 the XF-92A was shipped to Muroc Dry Lake, later to become Edwards AFB. Early tests were limited to taxiing, although a short hop was made on 9 June 1948. The XF-92A's first flight was on 18 September 1948 with Convair test pilot Ellis D. "Sam" Shannon at the controls. 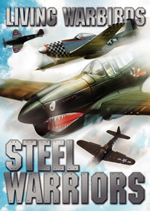 After company testing, the aircraft was turned over to the USAAF on 26 August 1949, with the testing being assigned to Frank Everest and Chuck Yeager. Yeager was the first Air Force pilot to fly the XF-92A. 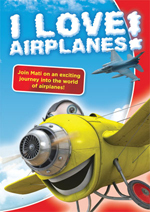 On his second flight he dived the aircraft in a 4 g split-S dive, reaching Mach 1.05 for a brief time. When approaching for landing on this flight he continued to pull the nose higher and higher in order to slow the forward speed to avoid the problems from his first attempt. 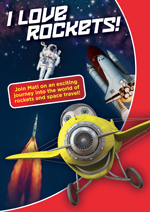 Surprisingly, the aircraft simply wouldn't stall; he was able to continue raising the nose until he reached 45 degrees pitch, flying under control in that attitude to a landing at 67 mph, 100 mph slower than Convair had managed. In 1951, the XF-92A was refitted with an Allison J33-A-29 engine with an afterburner, offering a thrust of 7,500 lbf. The re-engined XF-92A was flown by Yeager for the first time on 20 July 1951. However, there was very little improvement in performance. In addition, there were maintenance problems with this engine and only 21 flights were made during the next 19 months. A final engine change was made to the 8,400 lbf J33-A-16. On 9 April 1953, Scott Crossfield began a series of flights on behalf of NACA. These tests revealed a violent pitch-up tendency during high-speed turns, often as much as 6 g, and on one occasion 8 g. The addition of wing fences alleviated this problem. The delta wing's thin airfoil cross section, low weight and structural strength made this a good combination for a supersonic airplane (although the fuselage was of a pre-area rule design). The large surface area of 425 ft� (39 m�), and the low wing loading it had as a result, led to excellent low-speed performance as well. Very slow landing speeds could be achieved, at the cost of extremely nose-high landing angles and the resulting poor visibility. The combination of good high-speed and low-speed characteristics was very difficult to achieve for other planforms. 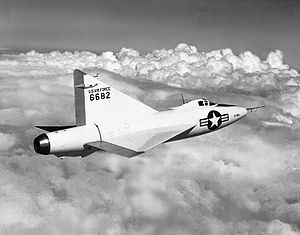 Although the XF-92 itself was not liked, the design concept clearly had promise, and the delta-wing became a "standard" layout on Convair designs through the 1950s and 1960s. 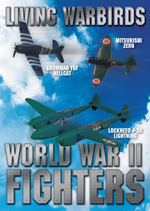 Of particular interest to aircraft designers was the unexpectedly good low-speed behavior Yeager had noticed on his second flight. The aircraft continued to remain controllable at very high angles of attack (alpha), where a conventional layout would have stalled. The reason for this turned out to be the unexpected creation of a large vortex over the top of the wing, generated by the airflow between the fuselage and leading edge of the wing at high alpha. The vortex became "attached" to the upper surface of the wing, supplying it with air moving at speeds much greater than the aircraft's forward speed. By controlling the flow in this critical area, the performance envelope of the delta could be greatly expanded, which led to the introduction of canards on most delta-wing designs in the 1960s and 1970s. More recently "mini-deltas", in the form of leading edge extensions, have become common on most fighter aircraft, creating the vortex over a more conventional wing planform. After a nosewheel collapse in October 1953 , the XF-92A was retired from active flying. It spent most of the next decade outside. In 1962 it was donated to the National Museum of the United States Air Force, Wright-Patterson Air Force Base, near Dayton, Ohio. It is currently undergoing restoration. 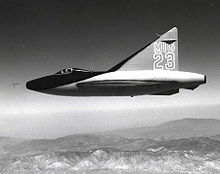 An unusual application of the XF-92A was as a movie model, stepping into the role of the "MiG-23" in the Howard Hughes film, Jet Pilot (1957 film), starring John Wayne and Janet Leigh. Due to the lengthy delay in releasing the film, by the time it appeared in 1957, the XF-92A's role had been left on the cutting room floor. It did appear in Towards the Unknown (1956) starring William Holden, again in the guise of another aircraft, this time, the F-102.